We continue our countdown of the most intriguing games for Texas Tech football this upcoming season. This week we are looking at number 2. I am super pumped for this game because of what has happened the past two years. In 2014 we were all turning off our TVs by the end of the 3rd quarter. In 2015 we saw one of the most miraculous endings in program history and left the Jones with our hearts broken. Tech and TCU have only met 58 times with Tech having a 30-25-3 advantage. The rivalry has been renewed since the Horned Frogs joined the Big 12 Conference in 2012. Since then, the series is even at 2-2. Three of those four games were decided by ten points or less. Last year the Horned Frogs went 10-2 in the regular season and finished with a victory in the Alamo Bowl against Oregon 47-41. In that game TCU overcame a 31-0 deficit at halftime to win. The comeback tied the largest one in bowl game history first done by, guess who...Texas Tech in the 2006 Insight Bowl. TCU's offense last season was ranked 6th in the nation. Two spots below Tech. The Horned Frogs were 9th in passing and 24th in rushing. Their defense was not great last year as they were 65th in total defense. TCU has a lot of talent to replace on offense. The unstoppable Big 12 duo of QB Trevone Boykin and receiver Josh Doctson is gone along with Kolby Listenbee and RB Aaron Green. They also lost FS Derrick Kindred as well as offensive linemen Halapoulivaati Vaitai and Joey Hunt. On top of all that, the man who led the comeback in the bowl game, QB Bram Kohlhausen, is gone too. Who will fill these shoes? At QB the choice seems to be Texas A&M transfer Kenny Hill. Kyle Hicks, the third-leading rusher on the team last year, returns at RB. Hicks only had 262 yards rushing and scored 3 touchdowns. Hicks may be the starter, but it remains to be seen. The biggest offensive weapon TCU has coming back is KaVontae Turpin, who was the team's second-leading receiver in 2015. Turpin finished with 649 yards and 8 touchdowns for the season. I love Tech's chances in this game because TCU looks like they have taken a step back. Tech is returning more talent on offense than TCU, especially at receiver and running back. TCU's defense should still be respectable since they only lost one player to the NFL. 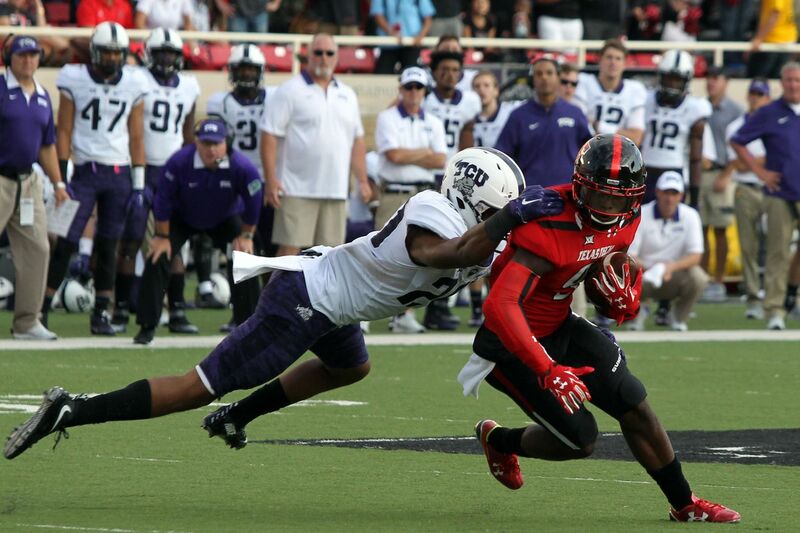 I think TCU's defense will be better than Tech's in this game but I believe Tech's offense will be better than TCU's. Hill will put up solid numbers against Tech's lowly defense but, as I have mentioned before, I got to give Patrick Mahomes the edge. Mahomes has played in the same system for two years while Hill has not. Mahomes has also put up better stats than Hill. In his college career Hill has only passed for 2,832 yards with 24 touchdowns and 8 interceptions. Mahomes threw for more than 5,000 in 2015. It will be hard for Tech going on the road to the same place they gave up 82 points in 2014, but this a different team. Tech is fueled by the last two years and will come out with revenge on their minds. If their defense comes to play and their offense can start hot, I believe Tech can pull away from the Horned Frogs by the fourth quarter.